Seven years ago, Rochelle Young’s life looked very different. She was a stay-at-home mom fulfilling her desire to be closer to her daughter, but it left their family struggling to make ends meet. Then, Rochelle attended another direct sales party, where she met her Mentor, Field Vice President Kristine Stevens. Rochelle was hesitant at first about direct sales, but Kristine was persistent and won her over. She officially signed her Origami Owl contract in October of 2011 and became a Designer. That’s when something life-changing happened. Soon after she realized she could contribute financially to their family, just like she had always wanted, Rochelle made a promise to herself that as soon as they had enough money, they would move back to North Phoenix to be closer to her family. And, in 2013, that’s exactly what Rochelle did. “I always say there is never a dream too big and anything is possible if you stay focused on what you want,” shares Rochelle. 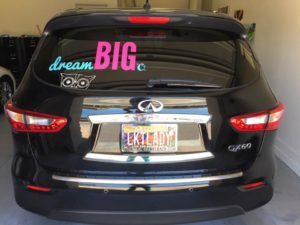 Thanks to her Origami Owl business, Rochelle has also been able to go to the Walt Disney World Resort® with her husband, daughter, father and his wife, and purchase her dream vehicle (pictured here). 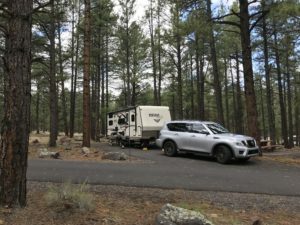 In addition to helping pay off debts, going on a special family vacation, moving closer to her family and buying her dream vehicle, Origami Owl also brought something very special to Rochelle’s life. Origami Owl helped Rochelle continue her mom’s work – to help people. Rochelle has even passed this pay-it-forward message on to her team. Rochelle says she also learned a valuable life lesson as an 18-year-old bank teller, and it’s carried over into how she builds her team. On top of being able to help people and give back others, Rochelle is especially proud of earning Field Vice President after a few significant setbacks. Rochelle decided she no longer wanted the negativity to consume her, so she set new goals for herself and her team. After taking charge of her business and working with her team, Rochelle was shocked when she looked at the numbers and realized how close she was to hitting Field Vice President. After earning Field Vice President, Rochelle knew exactly how she’d use her Advancement Bonus. Now, Rochelle has a few more goals she’d like to achieve in the next six months. Rochelle is also focused on helping and supporting her team reach their goals.